22. Should I work for free? This tongue-in-cheek infographic by illustrator and typographer Jessica Hische may be seven years old now, but it turned into something of a viral sensation and influenced a slew of homages – not to mention the fact it's every bit as relevant today as it was in 2011. Hische used the classic flowchart method to address all the possible perspectives on this notoriously thorny and divisive issue, and built her infographic using live text in HTML and CSS to enable translation into any language. If you'd prefer it in a more traditional format, however, it's also available as a letterpress print. Are you reading this slumped at your desk? You're probably not doing yourself any favours, posture-wise. And let's face it, even if your posture is great, spending 10 hours a day (give or take) sat staring at a screen ain't good for anyone's bod. Sort yourself out and keep yourself in shape with this top visual guide to 10 exercises you can do right at your desk, compiled by us and illustrated by the excellent Simon Middleweek. 24. What font is best for you? This brilliantly detailed infographic helps you determine exactly which font is best for you. Produced by Cartridge Discount, the graphic takes you on a history of typefaces and acts as a guide by delving into serif vs sans-serif, web fonts and ones for print, unique fonts and the future of fonts. Take a look and discover which font is best for you. This infographic from Online Logo Maker guides designers through the process of creating a logo by breaking down and examining some of the world's biggest brands. The best logos may look simple, but break them down into their composite elements and you'll find everything has been carefully chosen to convey something about the brand – as is explored here. If you're interested in finding out more, take a look at our articles on the use of shapes, colours and typography in branding. Artist Kelli Anderson was asked by Adobe to "make something interesting" for designers attending an AIGA event, and this paper-made infographic, the 'Existential Calculator', was her response. It aims to answer that age-old question: Should I take that job? Okay, we know that this calculation wheel might not give you all the answers to life's questions but it sure does look nice. Learn more about The Existential Calendar on Anderson's blog. No matter how much you stretch, take breaks or go for a stroll at lunch, the working life of a designer means spending most of your time at a desk. With this in mind, it's important to remember that you shouldn't just be taking breaks – you should be doing everything you can at your desk to ensure a healthy lifestyle. This infographic makes some important posture pointers. Whether you favour a sit-down desk or you've moved onto a standing effort, there are some brilliant tips to help your back, neck and shoulders stay in tip-top shape. This is the third iteration of Pop Chart Lab's popular superpowers infographic, the material sourced from the past 75 years of comic books and broken down into seven main skill sets: powers of the mind, animal powers, mastery, powers of the body, force control, object manipulation and weapons-based. This vibrant design is seriously impressive, the sprawling taxonomy of over 200 superpowers and 600 superheroes and villains spreading over six square feet. We're also loving the final rendered vintage-style design, which pays tribute to the great cosmic covers of the Bronze Age of Comics. Take a look at the infographic above and tell us you haven't spent hours, even days of your life thumbing several of the controllers you see! 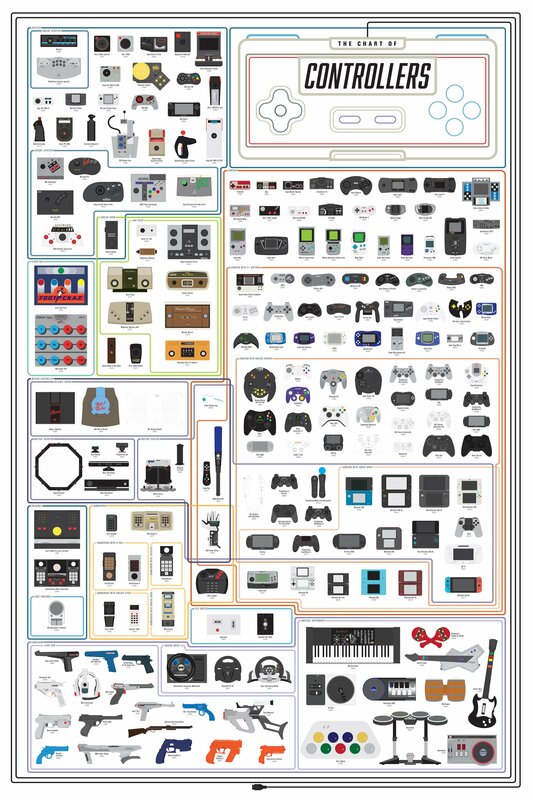 The wonderful people at Pop Chart Lab have created this infographic detailing the complete family tree of video game control schemes, including handhelds, joysticks, paddles, gamepads, rifles, steering wheels, and even a guitar. Ever find it hard to choose between serif and sans fonts? If so, this Serif vs Sans: The Final Battle infographic might come in handy. The infographic runs through what type of typography is best suited to different projects. It also features a cracking design with cute serif and sans-serif character...err...characters battling it out for supremacy. The result? Serif is better for print and Sans is better for web. We all thought that McDonald's and Starbucks were taking over the world; well, this clever infographic proves it. It looks at the number of stores each establishment has created, as well as their profits and produce. This great infographic was designed back in 2003, so the stats are out of date now, but it's still worth a look.